Breaking up is hard to do… InDesign files into individual PDFs that is! | Colecandoo! Breaking up is hard to do… InDesign files into individual PDFs that is! UPDATE 2015/9/8: I have created a solution that will save uniquely-named InDesign or PDFs from a Data Merge. See more about this script here. Several forums dedicated to InDesign advice have recently been asked the following question: “How to split an InDesign file into single page PDFs”. Splitting a large PDF into single page PDFs is possible via the extract pages feature of Acrobat 9 and up. 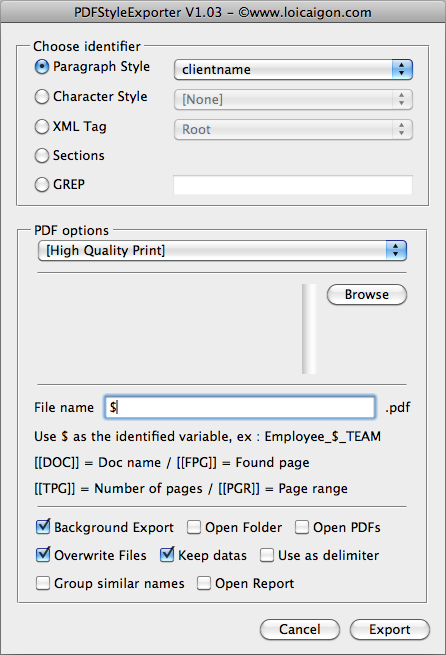 The resulting pages are then extracted to the same file location as the original PDF but contains an underscore and page number in the filename. Splitting a large PDF into fixed page lengths (e.g. singles, doubles etc) is possible via the Split Document feature of Acrobat X and up. This also provides limited control concerning the name and location of the resulting split PDFs, as well as other ways of splitting the PDF (e.g. filesize or bookmarks). So splitting a large PDF into smaller PDFs is possible via Acrobat. However, the brief was “How to split an InDesign file into single page PDFs”. By default, there is no way to do this directly from InDesign without a script. UPDATE 2014/8/24: I have written an article for indesignsecrets.com that demonstrates two possible ways of doing this via InDesign that do not require any scripting, but they are not one-step solutions. (updated 5 November 2013) Scripter Dmitry Lapaev offers three scripted solutions, but of these there are two that will be of most use to those who intend to output to print: the first is Quick Export to Adobe PDF (see this link here) and the next is Batch Export to PDF (see this link here). Fellow wordpresser Macgrunt has also produced an applescript that allows the export of single page PDFs from one InDesign file. While it does not have a user interface, it certainly does the job. Read more about his script here and read his related blog posts concerning renaming of files. UPDATE 2014/1/18: There are also paid solutions that can accomplish this task. One such solution is PDF Bee by Chris Paveglio. This has not been tested by Colecandoo, nor is this a paid endorsement. UPDATE 2014/8/1: There is a new standalone application that allows InDesign to reference an Excel file and prepare single record PDFs. This recent application again has not been tested by Colecandoo, nor is this a paid endorsement. So the question is answered… right? Yes and no. Yes, it is possible to export to individual or smaller page PDFs, but the naming of the files could be better. Using an example of business cards that have been data-merged to a new InDesign file, the brief is now to produce PDFs with filenames that reflect the names of the people on the business cards. Using the earlier solutions, the files would still need to be renamed afterwards. So how is this done? Loic has another script called PDF Export Cropper. This script is much more flexible than the previous scripts in that files can be split according to more variables, and the file naming is more flexible. To demonstrate, an example single sided business card has been created. The PDFs are to be named based upon the name of the person, so the field that holds the client’s name has been assigned a special paragraph style that is used nowhere else on the card – in this instance, the style “clientname” has been assigned. The file is then merged to a new InDesign file. 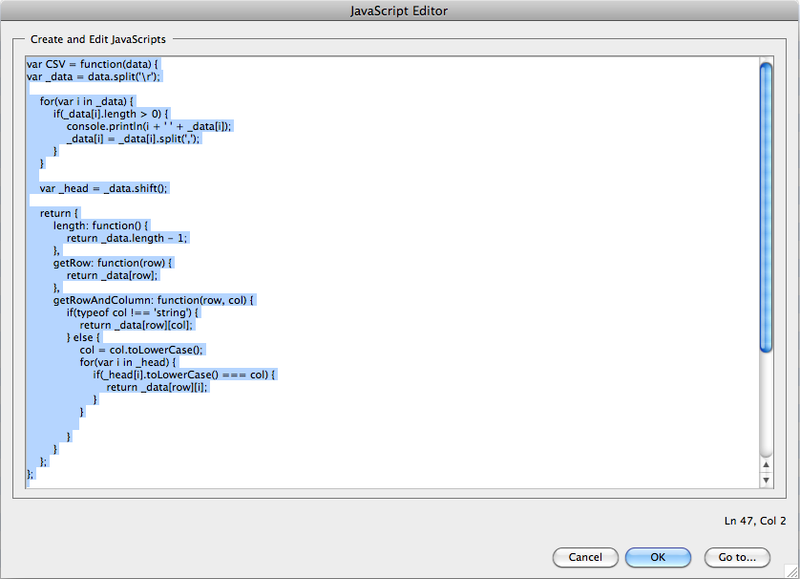 Once the new file is created, the PDF Export Cropper script is run. A new user interface appears. In this example, within the “Choose Identifier” portion of the interface, the appropriate paragraph style has been chosen. The filename is to be the name of the resulting paragraph style, so all that is left to do is click Export. And voila! The PDFs are split and named based on the client name that appears on the business card. The only downside – that the cards can only be one page (that is, if the business cards were double-sided, Loic’s script would not work). UPDATE 2014-01-14: Loic’s scripts are currently being revised and at the time of writing this update are unavailable. See his post here. German Swiss scripter Hans Haesler has a similar script to Loic’s script. Sadly for me, it is in German, so I can’t understand the user interface that the script creates. A link to the script and a brief how-to-use for Anglophones is available here. UPDATE 2014/7/19: There is an update to this script available from the original forum that discussed the initial solution. The update allows the PDF to be split into files longer than one page in size. See post 11 in that particular forum for the script. First, the action will have to be loaded by opening Acrobat, select the File Menu, Action Wizard, Edit Actions. From the new window, select Import and then navigate to the downloaded split files.sequ file. Next, create a new folder and copy the PDF to merge and the csv or txt file that was used for the data merge into that folder. A new window will open, and the file that is already opened should be listed in the window. Click Next. At this stage, the script presents an error. Click Close. Voila! 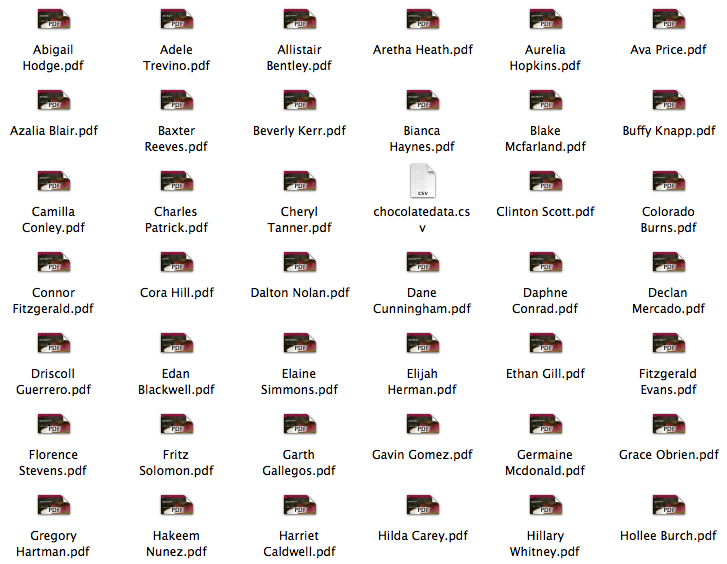 The PDFs are renamed based on the client names. The folder also contains the original PDF and the database files. So there are at least three solutions to this brief. 13 Responses to Breaking up is hard to do… InDesign files into individual PDFs that is! It’s main use is for DPS related work: Splitting a large file into separate articles and naming the InDesign files according to DPS naming conventions. Thank you for letting me know more information about Hans’ script. I’ve updated the article to reflect his location. On my site stats, this story is one that gets viewed more than others and I cannot believe the interest in splitting an InDesign file into single pages, so I imagine that the community sees this as a feature that would be welcome in future versions of InDesign. 1. In workflows for books with many authors or proofreaders, it will come handy to automate Export to PDF on chapter (sections) basis. 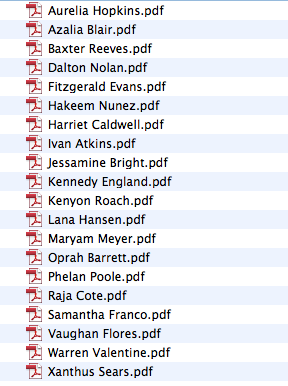 Sometimes even on individual PDFs for every single page. 2. In workflows for newspapers, at least in my experience with local newspapers here in Germany, a one-PDF-for-every-single-page workflow is required. Recently I had such a case: A special edition of a newspaper for students (written, photographed and layouted by students) where about 20 individual InDesign files were produced (two to three pages) and should be delivered as individual one page PDFs to the printers. Thank you for letting me know about Peter’s script. I have since learned of another script by Dmitry Lapaev that is similar to the one in the article but has some value-added features, so have updated the post to reflect this (I also had his web address incorrect – sorry Dmitry – извините Дмитрий). As for “why would one want to do it”, those thoughts were made on the adobe forums rather than this blog (http://forums.adobe.com/message/5597561#5597561 for reference). When writing this article, I felt it was important to run through the methods of accomplishing the task regardless of why the task of preparing split PDFs was required. It was ultimately something that many users wanted so I felt providing a solution was the appropriate thing to do. Visit the original thread that contained the script and navigate to post 11 – user alanomaly has improved upon the script to do exactly your request. Thank you very much for the update! Sadly, I cannot seem to get the script to function properly. And yes, shame on Adobe for not being able to implement this functionality within InDesign. What gives??? Where do i found the original forum post 11 from Alanomaly, i see no link here, and i really need that solution. Pingback: Data Merge from InDesign to unique filenames – now a reality | Colecandoo!